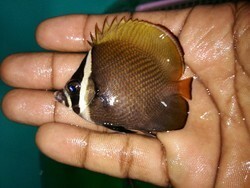 We are wholesaler and supplier of Blue Peacock Cichlid Fish which is also known as Aulonocara Nyassae. These fishes are well-known for its aggressiveness and easy handling, which we offer at diminutive price to please our clients. This species of angelfish is marine mostly found around the Hawaiian islands and is associated with coral reefs and is found at a depth range of 23m - 174m. It’s scientific name is Genicanthus personatus. We can source good and fancy ornamental fish varieties for export and import. Also assist in the marketing of tropical ornamental fishes produced in India. We provide to our clients best quality black molly. We are the foremost trader and exporter, involved in offering Oranda Fish. Imported quality fish like arowana, Flowerhorn.